A new seating area created away from the patio area. This country house had been recently renovated. 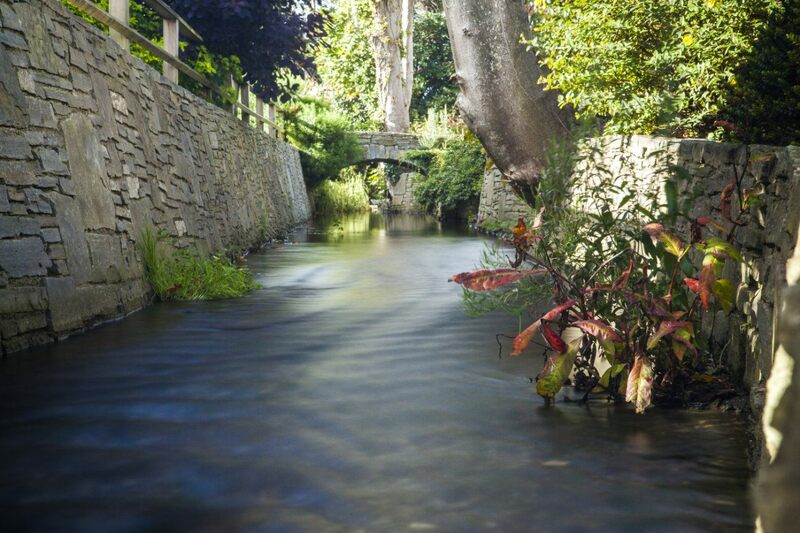 The client brief was to create an overall design for the garden which would make the existing stream a feature. 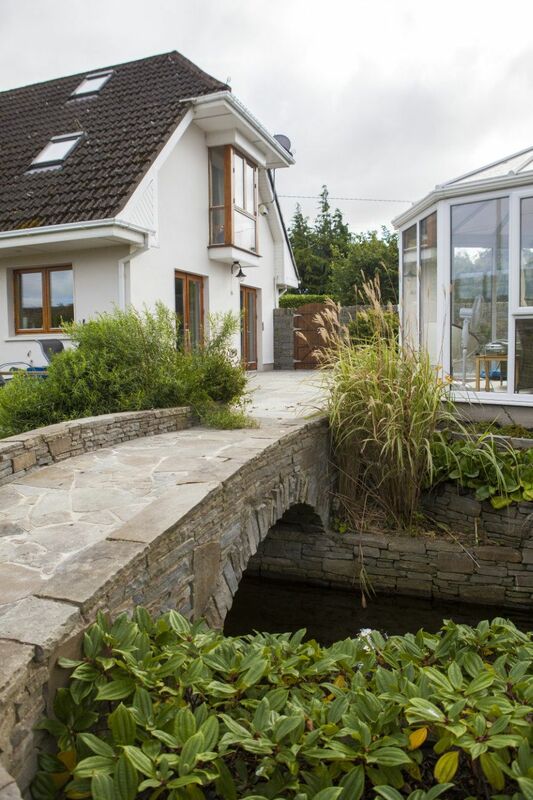 As well as the normal hard landscaping issues like a main patio adjacent to the house and raised beds, the clients wished to make the most of their large interesting garden. 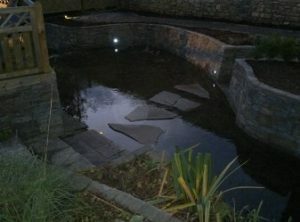 They wanted to have different areas to sit, from where they could view the garden, especially the stream. 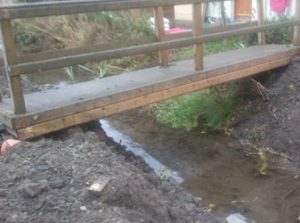 The existing banks of the stream were a maintenance problem and the access to the far bank of the stream was by an unattractive timber bridge. 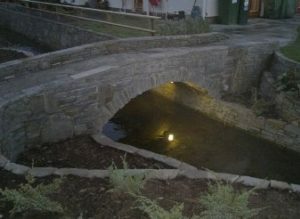 To replace the timber bridge with something more attractive. During the design process we decided to use Irish limestone as the face of the walls. The understated shades of grey would be more subtle than any lighter coloured stone. 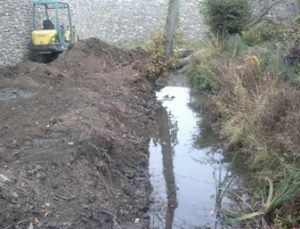 It was also decided to build two smaller retaining walls with planting space between them, rather than one large wall. 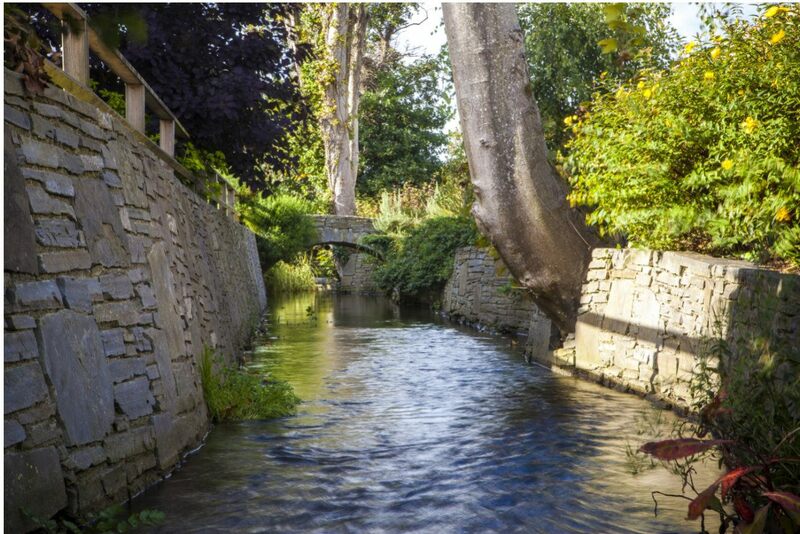 The planting at the mid-level would then soften the look of the stone by trailing down over the lower wall and by growing up to screen parts of the upper wall. 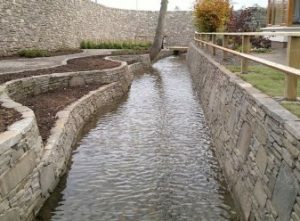 Replace the overgrown sloped banks of the river with stone walls creating level planting areas. 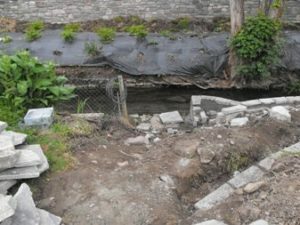 We used the same limestone to create the steps, as we had used in the wall, choosing large flat stones. In this way we could connect the steps right up to the wall. I also designed the steps to radiate out from the curve of the wall, thus connecting them physically and in the design. To create a seating place away from the main patio where the clients could sit and enjoy the best view of the river. By building two smaller walls we created a planting space to allow for more colourful planting. To keep the area low maintenance we block planted with groups allowing little space for weeds to establish.